It snowed all night. The blizzard that collapsed the Minneapolis Metro Dome visited our neighborhood too. Not as much snow, thank goodness, but lots of snowy white beauty. My husband and I set out on a late night blizzard walk. It was beautiful. We took the bike bath and went through the silent woods. Spectacular and serene to say the least. When was the last time you went out hiking at night.... in a snowstorm? We huddled under some resting pine trees on the golf course near our house. It was sweet protection from the wet snowflakes that were stinging our noses, necks and cheeks. Today, we woke up to this. 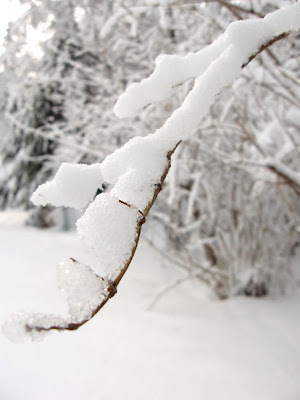 All of the branches in the yard were frosted with snowy icing. Even our "Halloween Spider...(that is still up) enjoyed a snowy treat! 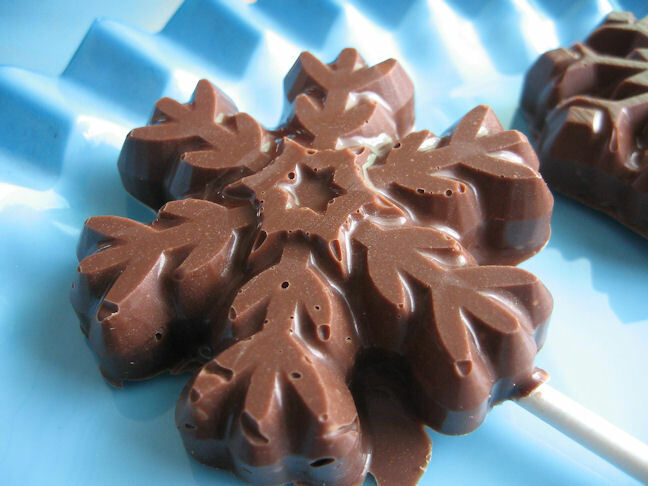 In honor of the snow, I made these wonderful milk-chocolate snowflake pops. Perfect for the stocking or giving away to those you love. I tried one, I couldn't resist. They are delicious! Easy.... all you need is chocolate! P.S. I feel like I cheated on this post... it's a bit on the "trim" size. Read my post from yesterday if you are looking for something with more grit and substance! he he! Aren't these the cutest?! They look so happy and seasonal. I envy your snow Megan. We'd not even had a dusting but are being pelted with high winds and cold temps! 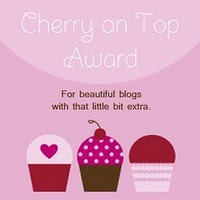 Always love visiting your blog! these are so incredibly cute and very fitting for the snow that many places are covered in these days. great idea! 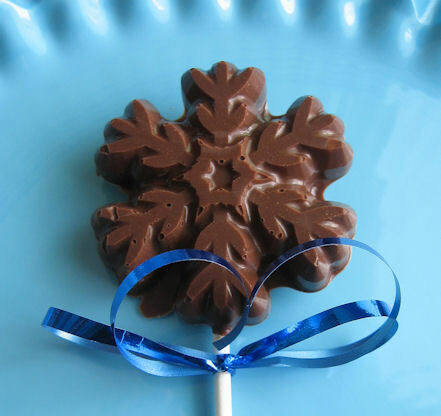 Megan - these are so cute - if I wasn't so fed up with snow I'd be making this now! It makes snowflakes palatable - even welcoming! These days I refuse to watch Frosty the Snowman but when I come around (I will eventually accept) these will be singing tome. Love the photos! Beautiful! Your snowflake pops are very cute. Never seen these molds before. Super nice! Loved your snow pics! I was just saying to my husband today that I really hadn't seen any snow pics yet. So beautiful! These are mad cool! I heard about the Metrodome. Wow. Nothing like snowshoeing when it snows like that. By eck your photography is breathtaking! Have you a new camera or something? What gorgeous chocolate moulds! You're so lucky to have such a charming snowy scene. I so wish I had snow like you!! Your snowflake pops are so great, just love the idea for winter time! Chocolate makes everything better. 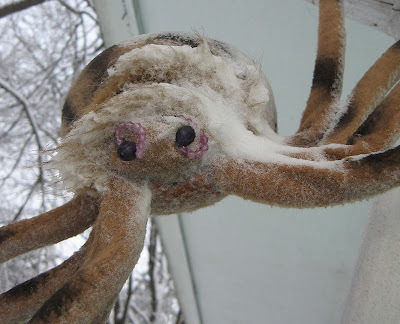 That snowy spider is perfect all year around if ya ask me. My lil ones would love that! I'd love some sticks! My friend bought me candy molds so i will use them for some chocolate for sure! Oh my gosh, those are beautiful! Those snowflake pops are delightful! 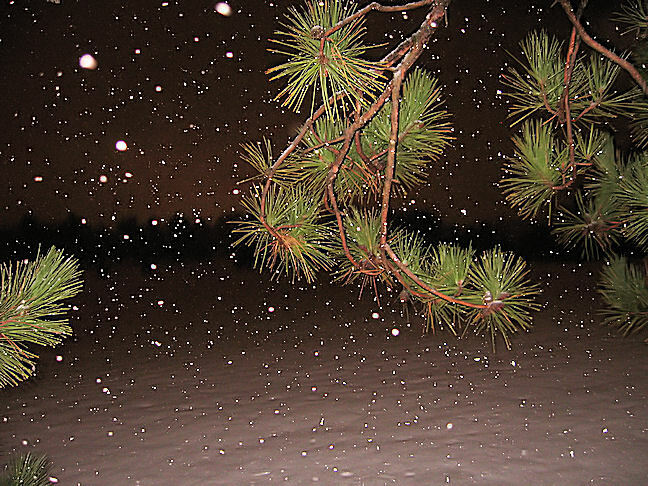 That was a romantic walk :) I love the picture of the pine with the snowflakes falling. Your snow pops are so cute, and they look so yummy. As for the snowflakes, we have tons of them in Chicago land! I'll have to take pics of our snow. Thanks for sharing! These are adorable, a cheerful treat to have in all that snow! If only these won't melt, please send them to me, LOL. Beautiful! Please send some ASAP, thanks :-) Also if you could package some of that snow in there I am really missing it here in TX! Amazing...they would be great as little gifts! These are adorable! I am buzzing them despite the fact that they are already top 9! Congrats on the Top 9! Yipee! So cute! A wonderful treat. does the chocolate just harden into the molds? so you just melt chocolate pour it into the mold...and they harden? so cute....so awesome...so simple!!!! cant wait to try this. These pops look awesome! I bet they taste delicious! Your walk with hubbie sounds so romantic! Love blue and brown. Lovely photos and pops! I'm so jealous of your snow, its the middle of summer In Australia, I'm wishing for a freak snow storm in a place that's never ever had snow. Your snowflake pops look awesome! Lovely pictures. Que preciosidad de chocolates, para empezar a comer y no parar. Me quedo a ver todo tu blog, me encanta. Beautiful pictures. 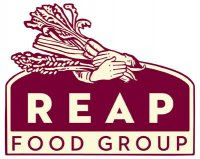 Great Post and congrats on being named Foodbuzz's Top 9!!! That is a pretty cool honor!!! Dearest Megan, I can imagine how freesing cold the other side of the globe right now. Just look at the snow out there. Btw, these chocolate pops are so cute! Love those molds. Are those plastic molds? I think it should be wonderful to mold out some candies. :o) Hope you're having a great day & stay warm. p/s Have you stock up everything yet? You better do so. Those snow storm doesn't sound good at all. Take care. 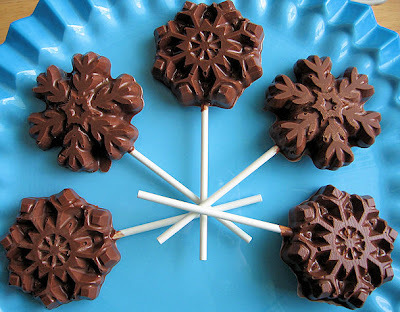 These chocolate snow flakes look so pretty! I was so impressed with the pops, that I went out to buy some molds and make some myself. I couldn't find the snowflakes, so I came back with penguins in scarfs and hats. After making the pops, I noticed that the chocolate started to melt very easily. Do you think this is because I used dark chocolate compound wafers instead of chips? Beautiful snowflakes! Blizzards can be a pain, but you can't doubt that they always look so beautiful the next morning. Really enjoyed the pics!